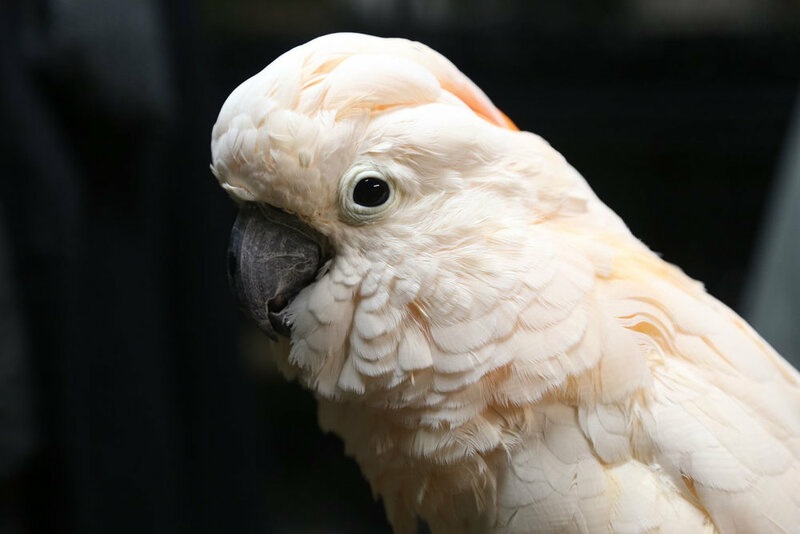 Pinkie is a Salmon-crested Cockatoo (also known as a Moluccan cockatoo), who can mimic language with the ability to learn one or two words per month. As she traveled the circle, Pinkie lived for a month at each location, where staff and visitors attempted to teach her words that are unique to their own identities. 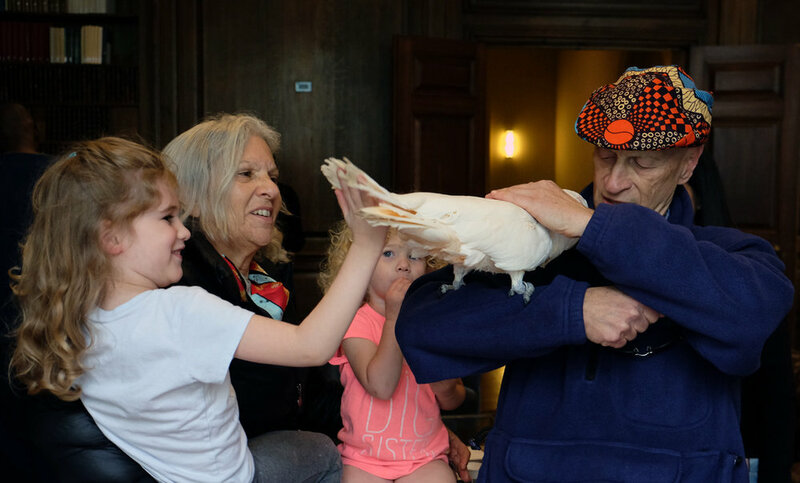 She remained under the careful supervision of a dedicated caretaker at each site, and received regular visits from a veterinarian as well as her trainer. 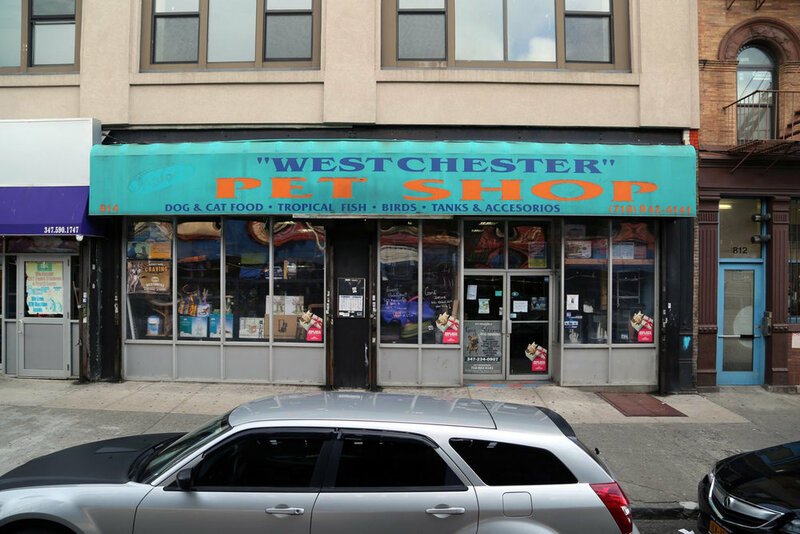 Pinkie comes from Pet Resources in the Bronx. 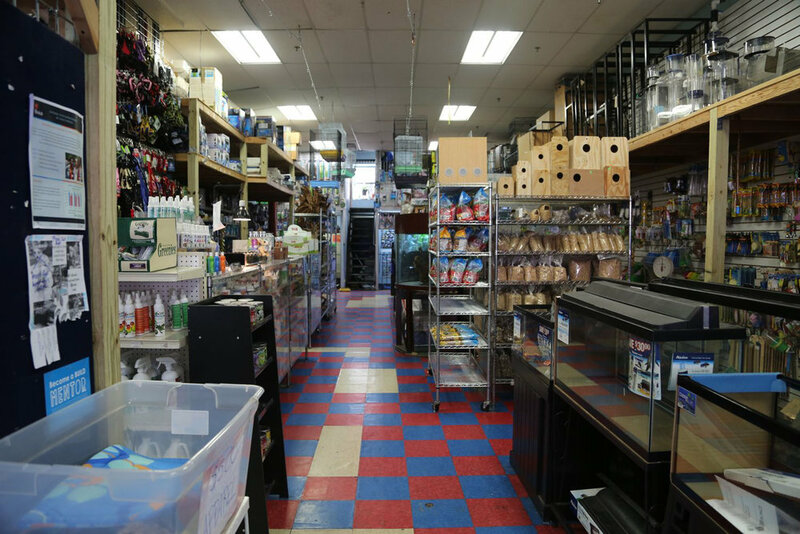 which is an independent neighborhood pet supply store dedicated to providing all the resources and supplies pet parents need. Follow the journey of the talking parrot below. 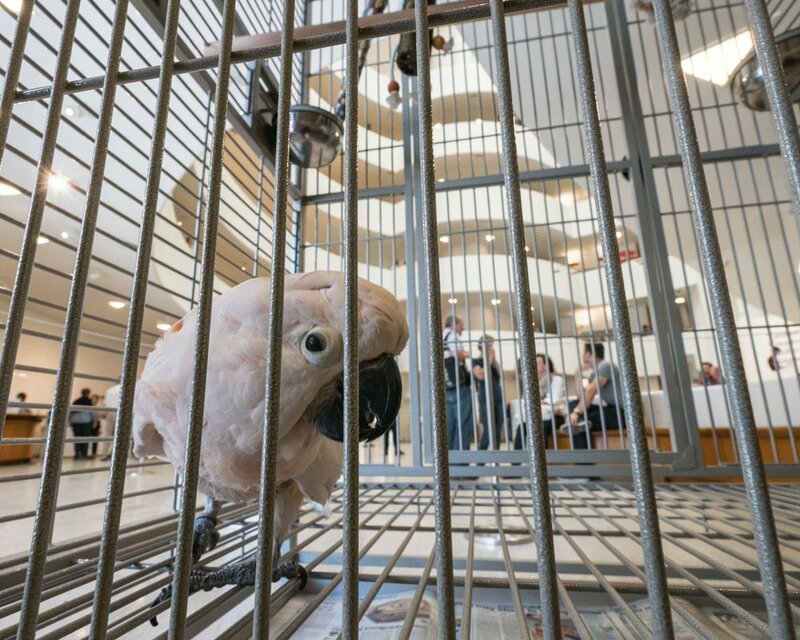 The Talking Parrot is being cared for at Frank Sinatra High School. She will be integrated into the life and curriculum of the school. Amongst many other things, she will be a life model for the art students during class and for the public in a special evening event. Visit the school to draw Pinkie yourself or to see a public display of drawings of the talking parrot. 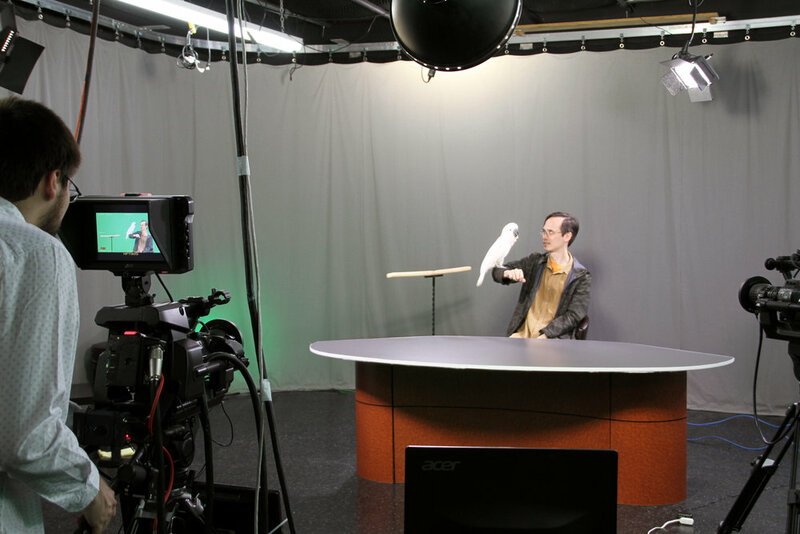 Throughout April The Talking Parrot will live at JUS TV headquarters. Over the course of the month she will be integrated into the daily life of the TV station both behind the scenes and on-air. The JUS producers will incorporate Pinkie into all aspects of their daily work including appearing on several shows as a guest, subject, and call-in “host”. Documentation will be posted here over the month or follow us @circleNY for live updates. 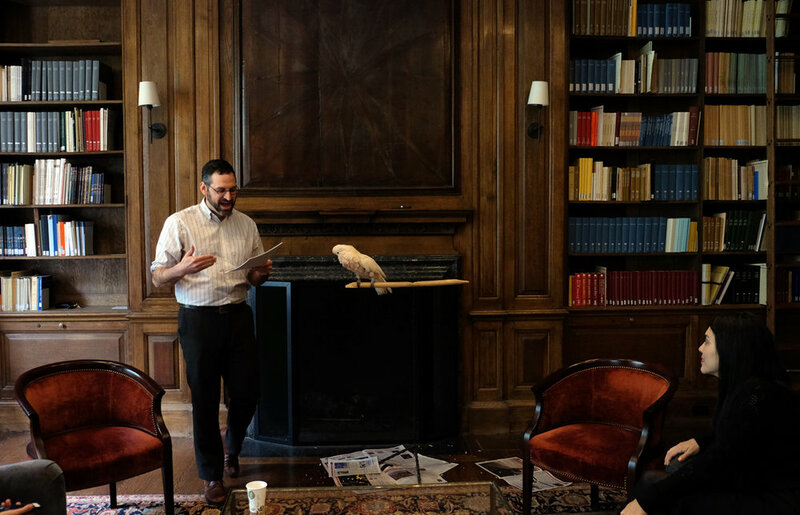 Throughout May The Talking Parrot will live at the Institute for the Study of the Ancient World. 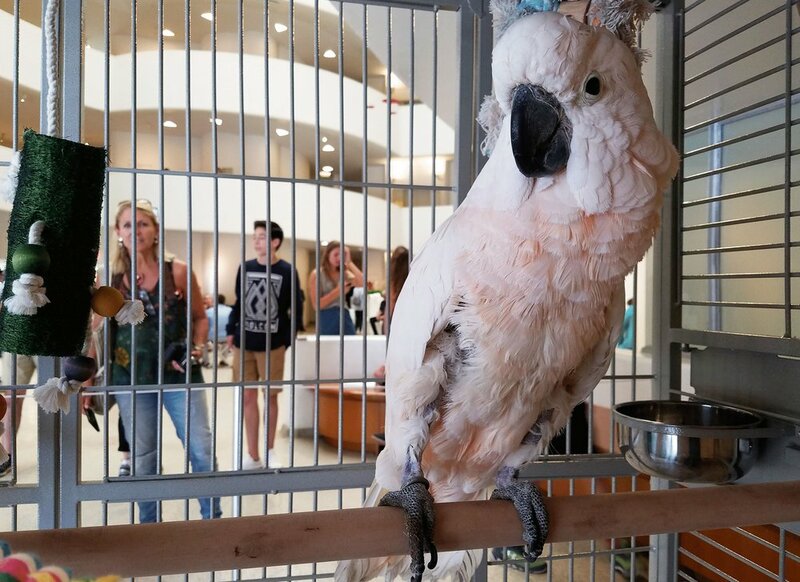 Visit Pinkie at ISAW to help staff try to teach her the Ancient Greek word for "democracy." 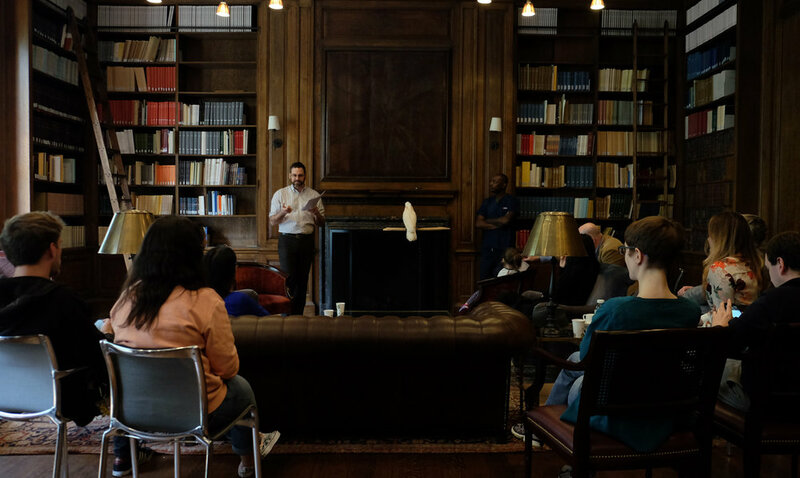 During Pinkie's time at ISAW staff will present two informal talks on the subject of Animals in Antiquity; see the calendar for details. Documentation will be posted here over the month or follow us @circleNY for live updates. 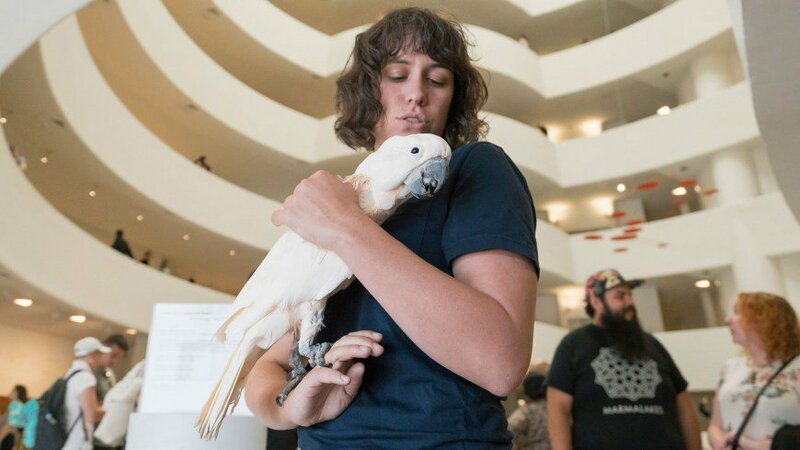 This June Pinkie, The Talking Parrot, is at the Guggenheim Museum, where she is residing in the staff offices and will be on view to the public regularly throughout the month. During Pinkie's stay, the museum is organizing a variety of programs for and around her. These include a film series specially curated for her, displayed on a monitor beside her cage on the Rotunda Floor. This series opens with a selection of non-objective films that were supported by the Guggenheim's founding director Hilla Rebay in the early 20th century. The program will develop over the course of the month in response to her engagement and interests. Visitors are welcome to view these films alongside Pinkie and should check here for information on additional programs later in June. 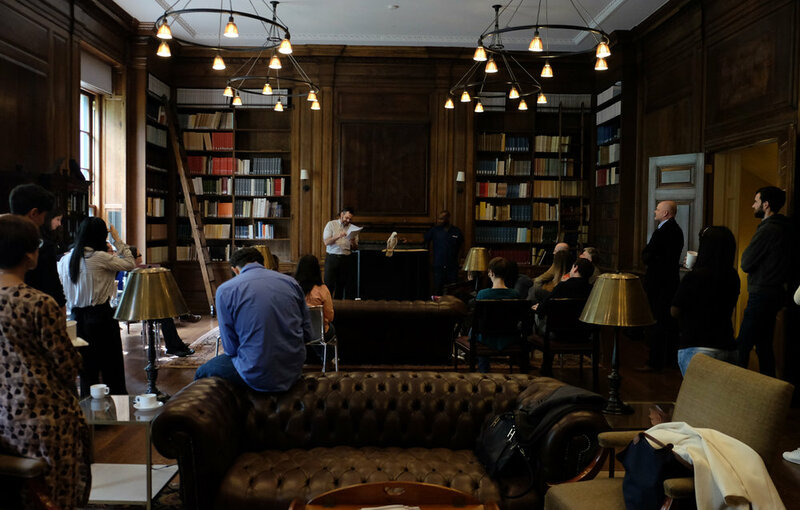 Documentation will be posted here over the month or follow us @circleNY for live updates. Pinkie returns home to Pet Resources where she will be share all the words she learned from each of the places that hosted her in . . .circle through New York.